I’m sure you’re frustrated. There are too many unemployed lawyers out there, and you don’t want to be one of them. You’re not sure what to do – you just want a paycheck, but throwing 500 resumes out into the world hasn’t helped you land a job. It’s too easy to put off the whole career question when you’re unemployed and just want a job. But you can have both a career you love AND money in your pocket! While I can’t guarantee you a job, I can put you on the right path to a satisfying career. How? *JDCOT members: log in to get The Career Mirror from your dashboard. **Gmail users: make sure our email comes to your Primary inbox rather than the Promotions tab. The single best thing you can do for yourself right now is determine what you want from life. This step is critical – and it’s often skipped! 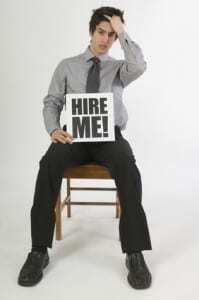 It might not seem like it, but unemployed lawyers have an advantage in seeking out the right career for them. I have counseled a ton of unhappy lawyers who followed the path of least resistance into a career they hate. They wish they had done some self-assessment before accepting a job. You have the opportunity to avoid this mistake. Plus, putting in the time to think about what you want is going to help you with your job search. 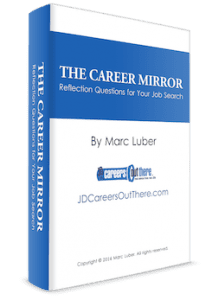 My self-assessment tool, The Career Mirror: Reflection Questions For Your Job Search, will help you determine the skills and qualities that make you a desirable job candidate. You’ll also discover your values and interests that will help to narrow down your search. You can’t find a career – or a job – you’ll love if you don’t know what you want! Once you know what you’re looking for in a career, it’s time to find it. After you fill out the reflection questions in The Career Mirror, you’ll learn how to use JD Careers Out There to find important information about career paths that interest you. By exploring law practice areas, you may gain knowledge that strengthens your job applications. Or you’ll expand your search to alternative careers for lawyers – we have lots of great video content to help you with that, too. Finally here’s what you’ve been waiting for! Now that you know what you want and which career fits you, it’s time to start getting paid to do what you love. Here’s some good news: After you fill out The Career Mirror, you’re going to be able to communicate your strengths and desires much easier. This will make you a more confident networker and interviewer, which will ultimately lead to good things. Be sure to watch your email, too, as I will be sending you more of my tips on breaking into a career you’ll love. If you have any questions along the way, don’t hesitate to contact me.